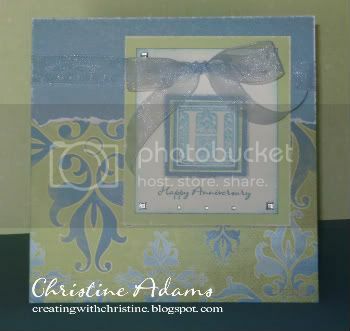 Here is a card I created for a friend of mine using one of my all time favorite paper packs - Emporium. Did you pick up a couple packs of this precious paper during our sale this month? I hope so! I used the Originals pattern - Tied Frame. It is a 6" x 6" card. 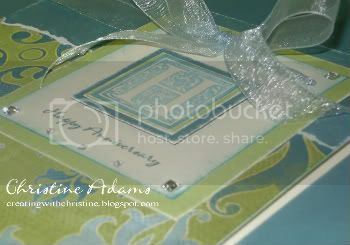 I also used our elegant Baroque Alphabet stamp set for the "H" monogram. (Their last name begins with "H".) 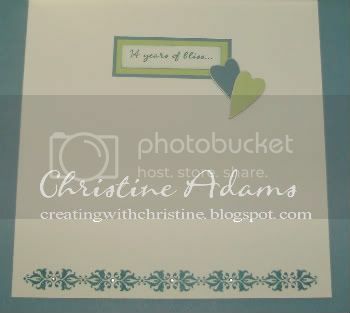 I also used our CTMH Font CD for the Happy Anniversary sentiment and inside sentiment. I used our Boutique Borders stamp set on the inside bottom of the card. (This set coordinates PERFECTLY with our Emporium paper designs!) Add in a couple of our square sparkles, organdy ribbon, foam tape - to pop up the monogram - and dimensional elements hearts, and voila! Happy Anniversary!